From Ellen Lorenzi-Prince (creator of the Tarot of the Crone and the Dark Goddess Tarot) comes a new deck, the Minoan Tarot. The deck is published by Arnell’s Art, 2014. The box: sturdy cardboard box with a top and bottom, top part (lid) slides in nicely. This is my favourite type of package. Standard boxes which are softer tend to wear and tear with use. I also don’t like to buy separate boxes or bags for decks, so this type is ideal. The manual: 92 pages, featuring all the 78 cards in full colour. Text by the author with a foreword by Rachel Pollack. Happy to say, this is not a standard LWB but a mini book, which also has a sturdier feel to it. Before going into card meanings Ellen introduces to us the Minoan culture and world. After the card meanings section there are two spreads based on the deck. “Selected Sources” ends the book, which is a nice thing to have in case one wishes to find out more about the Minoan culture. The cards: 78 cards, slightly larger size (14 x 7,6 cm) compared to the usual. All the cards have a blue border, with card titles in white. 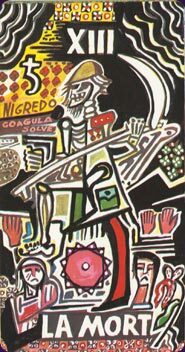 Non-reversible card backs feature a labrys (a double-headed axe used for ritual and ceremonial sacrifices) against a red background. While it would be easy to connect the four suits of the Minoan Tarot as Earth/Coins (or Pentacles), Sea/Cups, Sky/Swords, and Art/Wands, it is probably better not to do so. The same goes for the Court Cards. Based on the card meanings in the book, it is possible to make a connection and find similarities e.g. 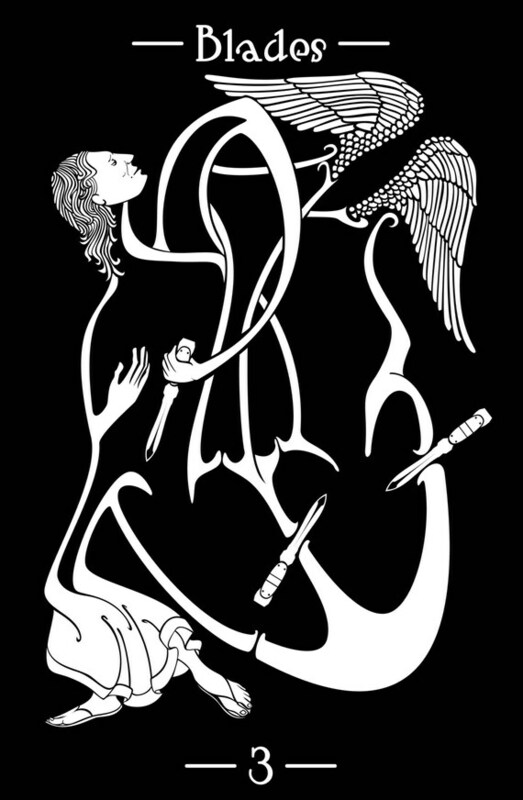 between Sea Three and the Three of Cups (Golden Dawn tradition), whereas with Sky Three and the Three of Swords (GD) that would not work so well. With the Court Cards the connection or associations between the Minoan deck and RWS / Thoth / GD works better, or is more in unison. But once again, I recommend not doing this. If you are using the Minoan deck for a reading, then why not focus on really using it, merging yourself with the images, instead of thinking “oh what is this card in my Thoth deck..”? The Minoan Tarot certainly can stand firmly on the ground without any support from other systems, tarot or not. The cards of the Minoan Tarot form a temenos in 78 pieces. While this could be said of any tarot deck in general, I would argue that the Minoan deck does this exceptionally well. I have visited Crete only once and that was over 10 years ago. But I do remember the impact of the place. The sea and sky felt somehow closer to you, and there was this feeling of freedom and happiness which I haven’t witnessed anywhere else. You could sense that in the locals, too. From the Heraklion Archaeological Museum I brought back a replica of the Snake Goddess (as Ellen writes in her book, “[this image] may be the most familiar Minoan artifact from New Palace Period”), which has ever since been standing on my altar as the centrepiece. Every single tarot deck is in itself a school of thought, and the Minoan Tarot “shows that a lively, peaceful, sacred, and technologically advanced society is no fantasy, but a part of our history.” (Minoan Tarot, p. 5) With every reading you perform with this deck you also learn more and more about the Minoans, who arguably had a much healthier relationship to nature and to life in general than we have today. Like the herb Dictamus or Dittany (Origanum dictamnus, grows only in Crete), the Minoan Tarot can help you find a healthier relationship with yourself and with the world around you. So what do the cards have to say about it? When does the Minoan Tarot work particularly well, to which kind of questions would it suit best? On a painted stone sarcophagus from the New Palace Period, the Goddess drives a chariot drawn by griffins. With the body of a lion and head and wings of an eagle, the sovereign of beasts and the sovereign of birds together, griffins are especially powerful and majestic creatures, as they harness the powers of both Earth and Heaven. Yet the Goddess does not strain to hold the reins on the magical beasts. Her control is effortless. The griffins await her will. The earliest and most enduring land transport on mountainous Crete was an ox-drawn wagon with solid wheels and no separate front axle. But the Mistress of the Chariot drives the latest and swiftest of vehicles, the “war chariot” with spoke wheels. With this power under her direction she may go wherever she likes, and pause along her way when she wishes. She embodies freedom. The Lady of the Chariot challenges one to take command of the journey. Confidence brings progress and progress reward. Harness your most noble aspirations with your most passionate dream. 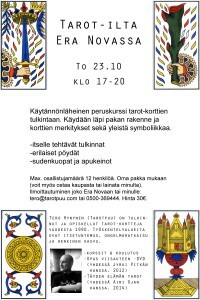 Tervetuloa Tarot-peruskurssille Era Novaan to 23.10 klo 17-20! Mukaan mahtuu max. 12 henkilöä, hinta 30€. After having spent 22 years studying tarot and doing readings on an almost daily basis, I thought it’s time now for something else. At least for a little while. So I decided to move to China, and start studying taiji (tai chi) & kungfu full-time. I’ve now been one month on my trip, and there’s still 8 months more to go. 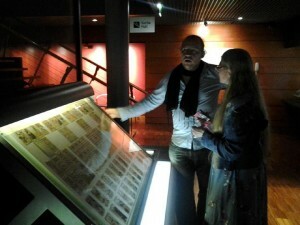 You can read about my experiences in my new blog, www.wudangjourney.blogspot.fi. I left my entire tarot library and deck collection back home, just took one deck with me: the one I started my tarot journey with, the Waite-Smith deck. I haven’t done any readings yet here in China, but there have been some lively discussions with a Canadian class mate who’s very interested in tarot. He’s got his first deck with him, the B&W Hermetic deck. Tarot has also made it’s way into my dreams – a few nights back I saw a dream where I was visiting the Atlantis Bookshop in London. I was just about to leave when Geraldine handed me a deck, saying “Have you seen this one yet? 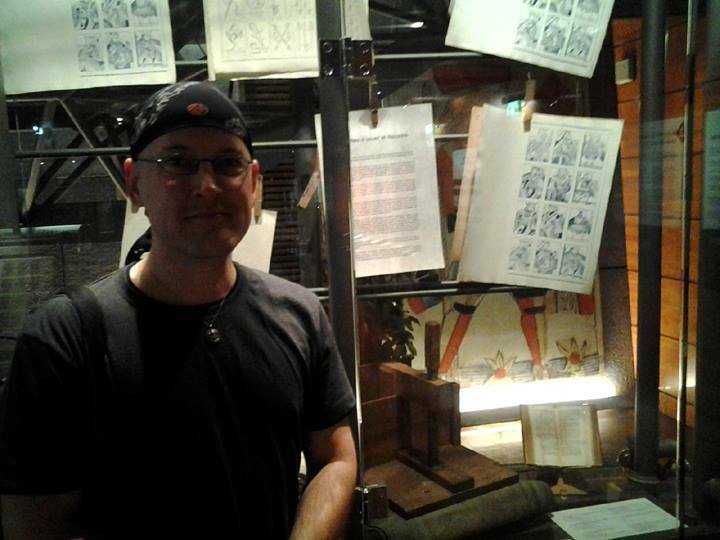 It’s the Kübler-Ross Tarot, made only 100 copies of it in 1918. Expensive, but you should get it now that it’s here.” I was sure the name wouldn’t produce any search results, so I was quite surprised when it did: Elisabeth Kübler-Ross (Wikipedia). 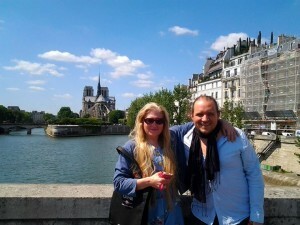 At the moment I’m not planning on posting any tarot articles while I’m on my trip, but who knows what will happen. Not doing readings and not studying tarot on a daily basis feels both very liberating and at the same time very odd – I’m sure it was no coincidence my unconscious decided to choose that particular name for the dream. I wrote this article for the Tarosophist Spring 2012 issue. When speaking of tarot’s history it is important to keep in mind two things: first, the exoteric and the esoteric history of tarot; second, the history of the term ‘tarot’, and the history of a pack of cards called tarot. Exoteric history deals with the actual information that has preserved down to us from the past; with tarot this refers to old cards (completely preserved packs are very rare), dated references to them (who paid how much, when and where and if we’re lucky, for what sort of cards) and their use, possible and pausible links regarding their spreading throughout the world, and so on. The esoteric history, on the other hand, is interested in different and occasionally rather wild theories regarding the origins and use of the cards. Many times this is about revealing the “true origin and nature” of tarot. Probably the most famous example between the exoteric and esoteric tarot history is the “theory of Egyptian origin”. According to many esoteric tarot scholars, tarot cards were invented in ancient Egypt and the cards contain the secrets of the universe (or something close to those lines), whereas the exoteric tarot scholars state that tarot didn’t exist before the 15th century. While I myself gladly follow the exoteric tarot scholars, I also keep in mind the fact that Renaissance humanism had its roots in Hellenistic / Ancient Greek philosophy, which in turn had its roots in Egyptian philosophy. So even though tarot cards most likely didn’t exist in ancient Egypt, the ideas and beliefs that can be found in tarot date back – at least indirectly – to Egypt. The earliest tarot cards come from mid-15th century Italy, but at the time were called Cartes de trionfi, ‘cards with triumphs’. By the 16th century this term was replaced by ‘tarocchi’ (still in Italy). The etymology of this word remains unclear. 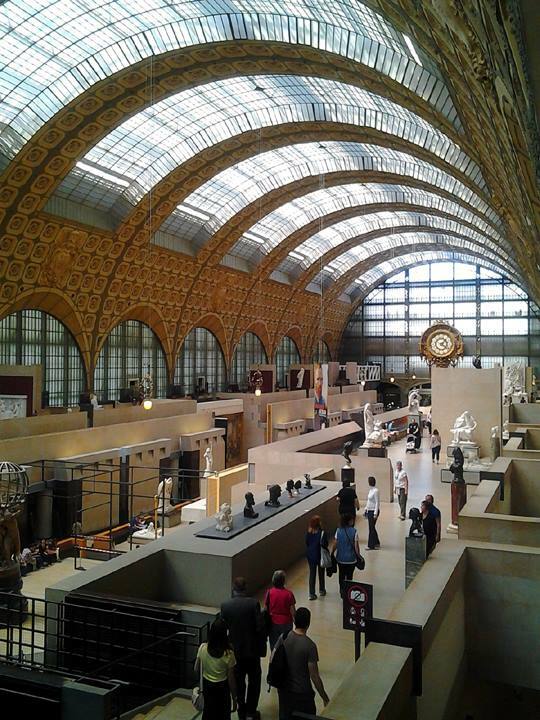 In 1694, the cardmakers of Paris called themselves tarotiers, which probably derived from the French word ‘tarot’. Before, in France the Italian term ‘tarocchi’ became ‘taraux’. There’s a small leap from ‘taraux’ to ‘tarot’. So, for the first 200 years or so people didn’t know “tarot cards” per se, because the term ‘tarot’ didn’t exist yet. Regarding the term ‘taroccato’ as mentioned in Cardini’s quote, it has also stood for a technique used in northern Italian courts for decorating illuminated manuscripts by punching and incising. Another possible source for ‘Tarocco’ (singular form of Tarocchi) could also be a dialect word ‘tarocar’, which refers to saying or doing foolish things during game or gambling. Also, there’s the Taro River, which flows into the Po River north of Parma in Northern Italy. If you believe the esoteric idea that the ancient Egyptians knew tarot cards then it follows that tarot is much older than playing cards. Here the exoteric history again says the opposite: playing cards were invented in China around the 11th century, and from there they travelled towards east. A more direct link to European playing cards comes from the Egyptian Mamluk playing card deck a.k.a. Mulûk-Wa-Nuwwâb, ‘Kings and viceroys’. 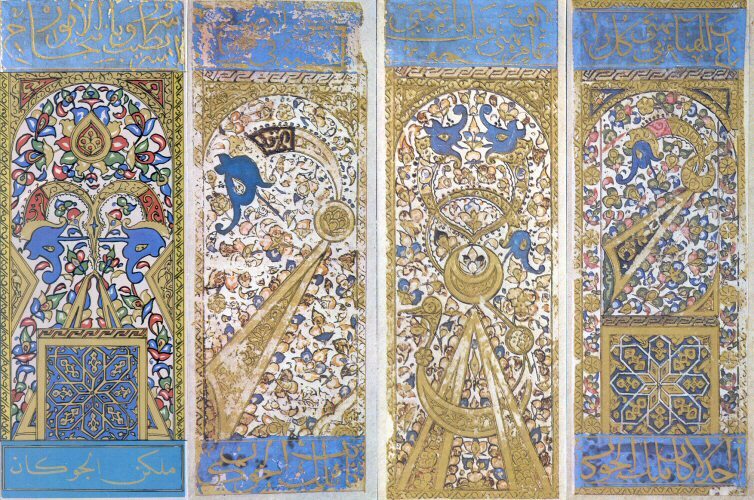 A lucky incident happened in 1939 when archaeologist Leo Ari Mayer discovered an almost completely preserved pack of Mamluk cards in the Topkapi Sarayi Museum of Istanbul. Even though there are no humans depicted in the Mamluk cards (as the Koran favours aniconism) there are many similarities with the first European playing cards, some of which come from Moorish Spain. From here they spread out to Italy and elsewhere in Europe, or then the cards first came to Venice (as Venetians were busy doing trade with the Mamluks; check out Venice’s Principal Muslim Trading Partners: the Mamluks, the Ottomans, and the Safavids) and then travelled “back” to Spain. Now we already have the four suit signs which are similar to those found in tarot, although Europeans mistook the Mamluk polo stick for a baton or wand. The first European references to playing cards date from the 1370s. Sir Dummett and many other tarot academics believe the 22 trump cards (which later became known as the Major Arcana) were added to the recently introduced playing card deck sometime before 1440s in Northern Italy. The wealthy and ruling Visconti, Sforza and d’Este families commissioned artists to paint exquisite cartes de trionfi for them. These cards were most likely used in a card game similar to the modern day Bridge. From these Visconti cards we have two almost completely preserved sets, which are among the oldest known tarot decks to date; the first one is the Visconti di Modrone a.k.a. 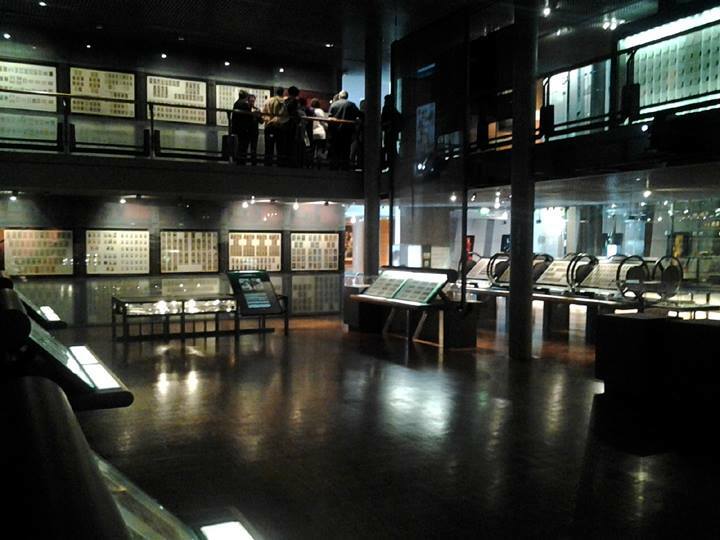 ‘Cary-Yale’ deck (dated 1441 by Dummett) and the second one the so-called Pierpont Morgan-Bergamo Visconti-Sforza Tarocchi a.k.a ‘Colleoni-Baglioni’ deck (dated 1450 by Dummett). The trump cards portray figures of both temporal and celestial powers, virtues and biblical scenes, and show iconographical resemblance to other works of art from the same period (compare e.g. to Giotto’s frescoes). The only two completely preserved decks from the 15th century are the so-called Mantegna tarocchi (ca. 1460), and the Sola-Busca deck (ca. 1491) which shows characters and warriors from ancient Rome. The Mantegna tarocchi is rather misleading for a title, as the deck isn’t a typical tarot deck, nor was it devised by Andrea Mantegna. Instead it has 50 cards grouped into five series (E-A) with 10 cards in each group. 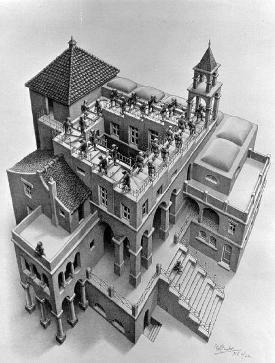 The deck is sometimes called “Neoplatonic ladders”, as it is possible to “travel” up and down the cards, as they show the evolution (or involution) from the lowest state (Il Matto, the beggar) to the highest (Prima Causa, first cause). These two very different decks – as well as the more traditional Visconti cards – attest to the possibility of tarot and likewise sets to have been used as mnemotechnical devices (Ars Memoria). The availability (and hence, popularity) of both playing and tarot cards is directly linked to the development of paper industry. The Visconti type cards were expensive works of art unavailable to anyone save the nobility. 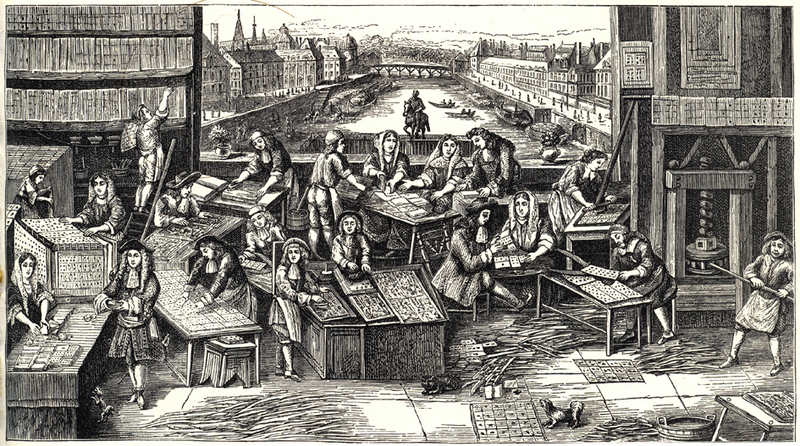 As the paper mills spread throughout Europe, printing of cards became a trade, and so the cards reached all levels of society. It is probably not a coincidence that both playing cards and paper reached Europe the same route (though paper preceding the cards); from China to the Islamic world, and then to Europe. As the mass production of tarot began in the 16th century the Tarot de Marseille became the standard pattern. Simple and yet complex images brought to life by woodcut printing ganed huge popularity – soon the Marseille tarot appeared here, there and everywhere. Standardization was the key, and the same happened to playing cards, too (two colours, simple images). For now, the age of hand painted works of art was over (see e.g. 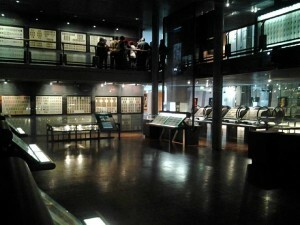 the Ambras deck (ca. 1445), Hofämterspiel (ca. 1460) or the Stuttgarter Hofjagdspiel (ca. 1431)). Michael Dummett has estimated that in the 16th Century around half a million Tarot de Marseille decks were made in France, and in the 17th Century around a million – out of these, only three or four have made it to our days (and not all in a complete form). It is also important to remember that tarot was still a game during this period, at least for the majority, although other uses most likely coexisted too. The fact that the Mantegna tarocchi looks the way it does, tarocchi appropriati (16th century) or Le Sorti intitolate Giardino di Pensieri by Francesco Marcolino da Forli (1540) speak of other uses of the cards, from cultivation of the mind and spirit to entertainment to fortune-telling. 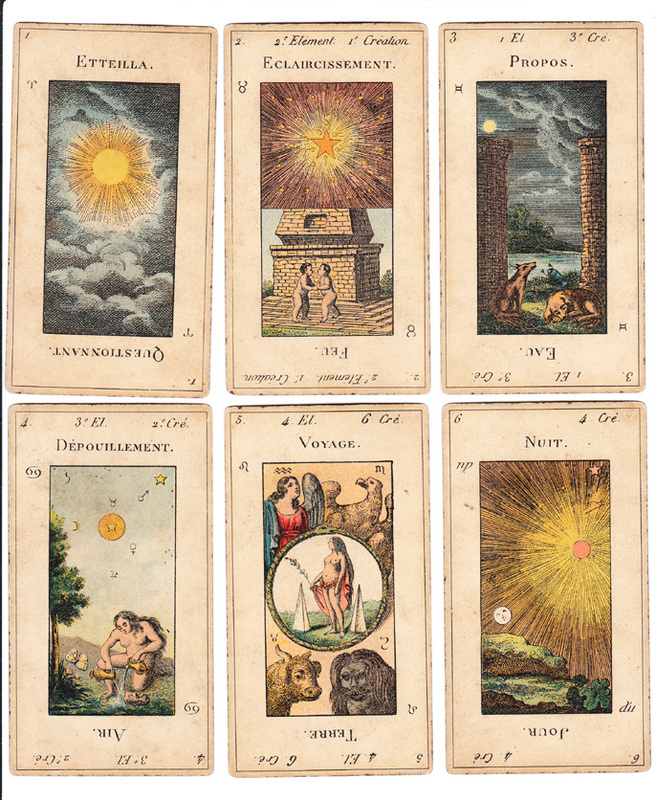 It was in the Age of Enlightenment in France that the Big Bang for the esoteric tarot happened, and when tarot began to be used for fortune-telling – even the tarot academics are happy to admit this. Antoine Court de Gébelin (ca. 1719-1784) was a freemason and a protestant pastor, and it was he who first wrote about the Book of Thoth [read: tarot cards]. According to him, tarot was invented in ancient Egypt and it contained, quite simply, the wisdom of the world. 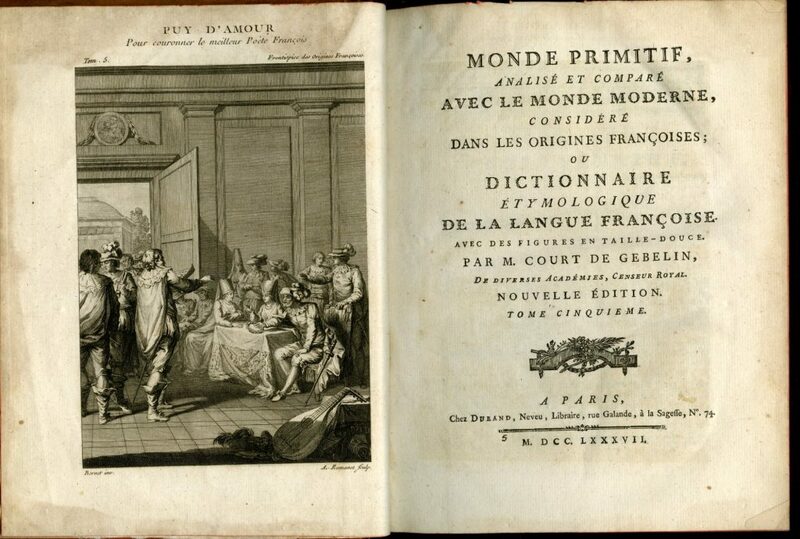 He published his theories in the massive encyclopedia, Le Monde Primitif (1777-1796). The 8th volume (1781) contains the seminal essays: Du Jeu des Tarots written by Court de Gébelin himself, and Recherches sur les Tarots, et sur la Divination par les Cartes des Tarots by his friend Comte de Mellet (Louis Raphaël Lucrèce de Fayolle, 1727-1804). Here, for the first time, the relationship between tarot and the kabbalistic Tree of Life were published. The age was ripe for secret societies, and tarot made its way into the occult world. 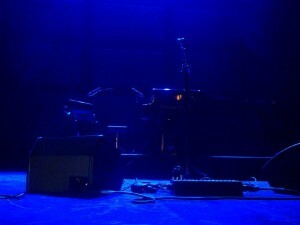 It was gladly received. Instead of focusing on Court de Gébelin’s and Comte de Mellet’s achievements, I’ll dedicate this final paragraph to someone less famous and less fortunate: Jean-Baptiste Alliette a.k.a. Etteilla (1738-1791). He had been a fortune-teller in the past, using ordinary playing cards. After the essays expounded in Le Monde Primitif, he became one again, this time using tarot cards. Etteilla is to be thanked for the many “firsts”; new ideas he brought into reality and which have since then become standard tarot practise. His name already reveals one of these “firsts”: by reversing his surname he began a tradition of pseudonyms, which e.g. Eliphas Lévi (Alphonse Louis Constant) and Papus (Gérard Encausse) continued. 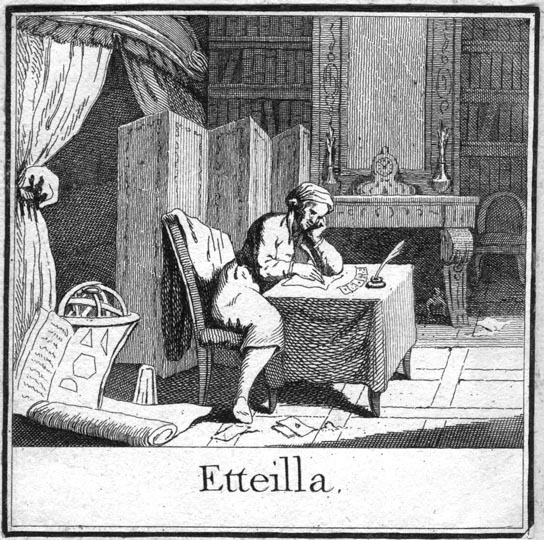 Etteilla also invented the first tarot deck specifically designed to esoteric purposes and fortune-telling (Grand Etteilla: Ou Tarots Égyptiens), as well as the first tarot book for the exact same purpose (Manière de se récréer avec le jeu de cartes nommées tarots, ‘How to entertain oneself with a deck of cards called tarots’, 1785). His deck bore many innovations; firstly, he numbered all the cards from 1 to 78 (the Fool occupies the last position). Secondly, all the cards have keywords written on them both upright and reversed. Thirdly, his deck was the first to combine zodiacal signs and the four elements to specific cards. Other “firsts” include e.g. 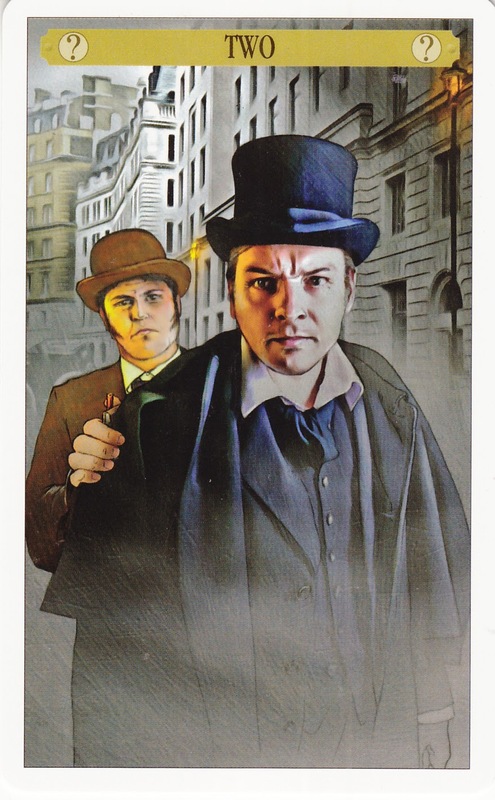 inventing the term cartonomancie which then became ‘cartomancie’ and from here we get the English word ‘cartomancy’. Etteilla also was – most likely – the first person to promote card reading as professional activity. He even set up a school with his son, Société des Interprètes du Livre de Thot (1788), and also deviced the largest tarot spread ever known, the Great Figure of Destiny which uses all of the 78 cards. Later tarot generations would come to accuse Etteilla of many things, denigrating his achievements to nothing, calling him an opportunist – perruquier Etteilla – who betrayed the “true Tarot” just like the Hermit with the keyword traitre on the cover of this Tarosophist magazine. But Etteilla was no traitor (nor was he a wigmaker). He was a tarot pioneer in so many ways, looking into the past with the light of his lantern, trying to find the long lost wisdom of the ages. In so doing he in fact reached into the future, and changed the future of tarot itself forever. 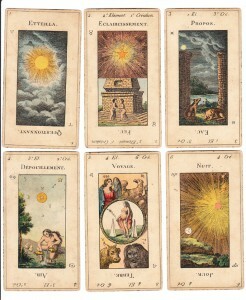 The year Etteilla published his tarot deck, 1789, was the year the French Revolution began. Etteilla truly mirrored the spirit of his Age. As the Cries of Paris reached the rest of Europe, so would tarot reach across the Channel, and spark another sort of revolution in the lives of the members of the Hermetic Order of the Golden Dawn. 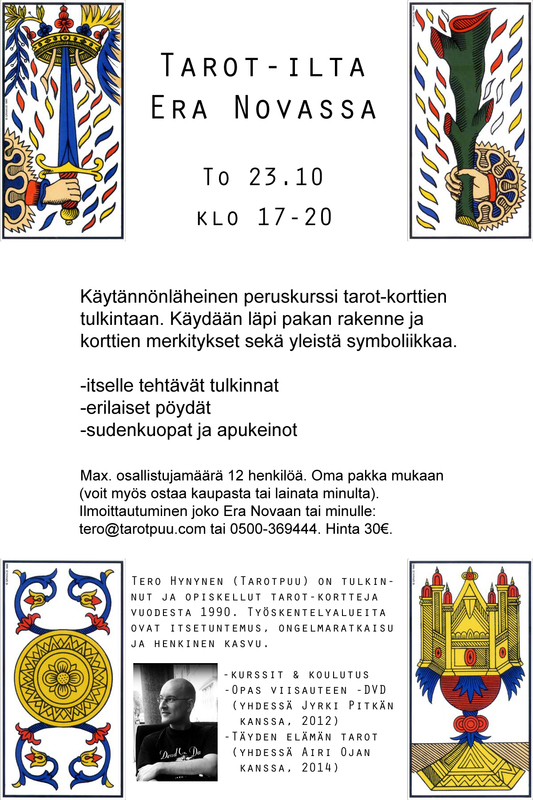 Nyt se on taas täällä, nimittäin Airi Ojan ja allekirjoittaneen räväkkä Tarot & Numerologia -yhteiskurssi! 14.-15.4 la & su, eli varatkaapa allakoihinne ja ei kun ilmoittautumaan. Kahdeksan ensimmäistä ja onnekkainta otetaan mukaan! This post is about new tarot books that I’ve recently acquired. I hope it will wet your appetite and make you spend even more money on tarot books. Part 2 coming up in the not-too-distant future, with Enrique Enriquez’s Tarology, Abiding in the Sanctuary by Tali Goodwin & Marcus Katz, Mary K. Greer’s Who Are You in the Tarot?, and Marcus Katz’s Tarosophy. Court de Gébelin, Antoine: Monde Primitif – Analysé et Comparé avec le Monde Moderne, TomeVIII (Elibron Classics, Adamant Media Corporation, 2006. Paperback). French text, with just 45 pages on tarot out of the 600. 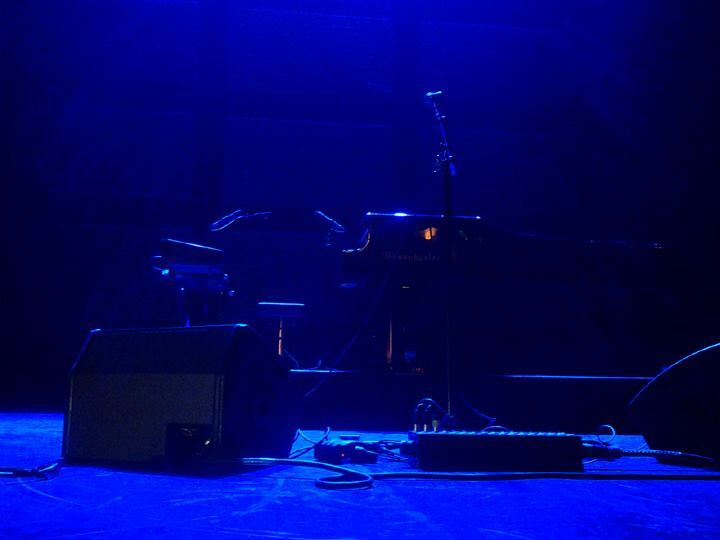 But still, this is it folks. Court de Gébelin, alongside with Comte de Mellet and Etteilla, is the forefather of modern esoteric tarot, and Part 8 of the massive Le Monde Primitif (1781) Encyclopedia by Court de Gébelin contains the seminal essays. And while Decker, Depaulis & Dummett have translated into english the key parts of the text in A Wicked Pack of Cards, and Jess Karlin has taken it all even further in his Rhapsodies of the Bizarre, I still love to have the original french text. Du Jeu des Tarots begins on page 365, while Comte de Mellet’s essay Recherches sur les Tarots, et sur la Divination par les Cartes des Tarots starts on page 395. 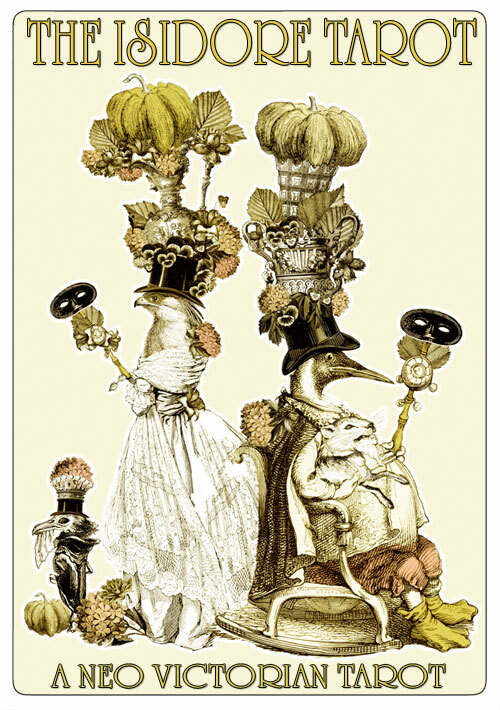 Included in this Elibron Classics Replica Edition are also the Major Arcana cards and the four aces, drawn by Mademoiselle Limote. 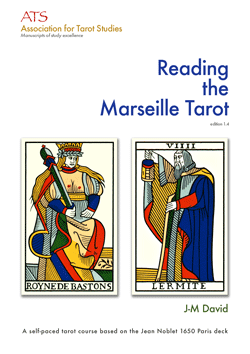 David, Jean-Michel: Reading the Marseille Tarot (Association for Tarot Studies, 2009. Paperback) J-M. David is one of the founders of the Association for Tarot Studies, the creator of Tarotpedia, and editor/publisher for a small number of books for the ATS. His academic background is in Philosophy (which he has also taught at University), and is currently teaching in a High School and in a Steiner Adult Education institution. “A self-paced tarot course based on the Jean Noblet 1650 Paris deck arose out of course materials written for an online 30-week tarot course.” A big book, both in its size (A4, 535 pages) and content. While reading this book there’s been a recurring thought in my mind: “I wish Jean-Michel had been my history teacher at school.” There’s just so much information on symbolism, iconography, history, philosophy, politics, religion, art, tradition, lots of pics and lots of comparisons between decks, that I think I’ll be going through this tarot course over and over again. And what J-M. has the most – and which shines like a beacon throughout this work – is wisdom. This is not about presenting loads of data for its own sake, but getting to the core of it: what it means and what you can learn about yourself through understanding it, as presented in a ‘simple’ pack of cards. Plus the fact that it’s not like we’d have too many english language books on the Marseille tarot. Although this book clearly focuses on the Major Arcana or trump cards, there is additional information on pip cards and other topics as well. These include chapters on:  The Pips;  The Courts;  Number;  Virtue;  About Readings, Eschatology & Metaphysics;  Elements & Alchemy; and  Astrologos. 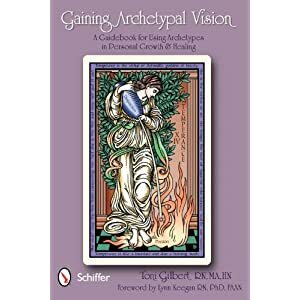 Gilbert, Toni: Gaining Archetypal Vision – A Guidebook for Using Archetypes in Personal Growth & Healing (Schiffer Publishing Ltd., 2011. Paperback, 128 pages). For over twenty years, Toni Gilbert has used insight-producing modalities such as Tarot, astrology, dream interpretation, and other shamanic tools to enhance her life and her alternative nursing practice. I first came to know of Toni Gilbert through her first book, Messages from the Archetypes, with its lively case stories and ‘upper/lower level’ interpretations of the cards. To me this book is, in short, Tarot Healing in the flesh. Toni’s new book, Gaining Archetypal Vision, feels very much like a Part 2 of the Messages, where you get to know the inner mechanics of healing via archetypes, whether you then connect it to tarot or any other system. As the title suggests, this book is not about tarot per se, but on ‘living archetypes’. What I love most about this book is the fact that you can easily see Toni has a deep understanding of the human psyche and archetypes – and she can present the information clearly and in an entertaining manner. Even though the book only has 128 pages, don’t let it fool you – there’s a lot of Stuff in it. While reading through Archetypal Fundamentalist / Conservatives / Liberal and Spiritualist, I couldn’t help making comparisons with tarot (ok, I was doing that throughout the entire book). And that’s one of the nice things about this book; whatever your ‘tool’ is (provided it’s somehow related to understanding the human life) this book will spark new ideas about how to use your own toolkit. And seeing Maslow’s hierarchy of needs sitting side by side with the classical Chakra system ‘spiced up’ was just the ‘rad Toni’ I was expecting! Chapters include:  Archetypal Vision;  Archetypal Thought as Inheritance;  Archetypal Growth and Development;  Health as Expanding Consciousness;  Archetypes of the Community;  Archetypes and Patterns of the Archetypes; and  Archetypal Tools for Healing in the 21st Century. In addition, there’s the wonderful Introduction: The Unfolding of an Alternative Nursing Practice where you feel like you’re walking with Toni as she tells you her own story and how archetypes came to (her) life. Many tarot readers are aware of and actively use the so-called Personality, Soul and Year Cards. These cards are based on counting your birth date numbers together (or in the case of the Year Card, adding the numbers of the day and month to the current year), then adding each digit in the resulting sum to finally get a number from 1 to 22. This number (or numbers) corresponds to the Major Arcana card of the same number. According to Mary K. Greer, “Personality Card indicates what you have come into this particular lifetime to learn. The corresponding Soul Card shows your soul purpose through all your lifetimes.”, while the Year Card “representing the tests, lessons and experiences you will go through this year.” (Tarot for Your Self, 1984. P. 11 & 14). Angeles Arrien writes, “The Personality Symbol [Personality Card] represents your expression in the outer world, your talents, gifts, resources; and how others see you… the Soul/Spiritual Symbol [Soul Card] represents the deepest core of who you are. This symbol provides an internal base of energy and natural resource for you to draw upon for your personality expression… Your Growth Symbol [Year Card] reveals all the possibilities for growth, opportunities, expansion, and challenge during the current year from birthday to birthday.” (The Tarot Handbook, 1997. P. 230). a) 21 + 7 + 1977 = 2005 -> 2+0+0+5 = 7. Seventh card of the Major Arcana = the Chariot. b) 2 + 1 + 7 + 1 + 9 + 7 + 7 = 34 -> 3+4 = 7, the Chariot. My Personality and Soul Card is the same. a) 11 + 5 + 1946 = 1962 -> 1+9+6+2 = 18 -> 1+8 = 9.
b) 1 + 1 + 5 + 1 + 9 + 4 + 6 = 27 -> 2+7 = 9. You can see the first method gives you a bigger number, which you can still reduce to get a smaller one. In this case 18 or the Moon is the person’s Personality Card while 9, the Hermit, is the Soul Card. a) 21 + 7 + 2011 = 2039 -> 2+0+3+9 = 14, which in tarot is Temperance. You can also reduce 14 to get 5, the Hierophant. b) 2 + 1 + 7 + 2 + 0 + 1 + 1 = 14, Temperance. What I find interesting (among other things) is cycles, and themes repeating themselves. If you have already counted your Year Cards for a longer time period, you will most likely have seen that they don’t follow a simple pattern of 1 to 100. Instead, they suddenly go back from 13 to 5 (from Death to the Hierophant, that is) and then begin ascending again, until they might reach 14, Temperance, before jumping back to 6, the Lovers. I know it is not the same as what the term signifies in astrology, but I call these “going down to climb up again” cards and years as retrograde. I find it incredibly fascinating to monitor these “peak years followed by a base-jump” years and experience all that goes into them. 7 (1977), 8, 9, 10, 11 -> 3 (1982) so in tarot that is from Justice to the Empress. 4 (2073), 5, 6, 7, 8 (2077). Important thing: with a two-digit Year Card I always take into account the reduced number and the corresponding card as well. So now that I’m in my 14 / Temperance Year, I also keep in mind the Hierophant, number 5. I find it strangely comforting and almost school-like, that with each and every cycle I’ll be able to go one step further, and also get to start (again) one step further compared to the previous cycle. It is also interesting to note where your Personality / Soul Card travels in these cycles. So the winner is 11, Justice! Now you count yours and tell me what is your Lifetime Lesson Card. Go on, do it!